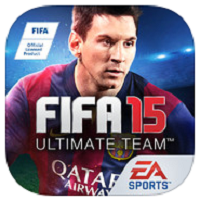 FIFA 15 Ultimate Team is the latest edition of the popular series from EA. It’s previous games have been very popular, and this latest release builds upon them. Numerous improvements have been added, and the graphics have been enhanced for both the Android and iOS platforms. In this installment, the game focuses entirely on the team mode, and it goes deep into the card collecting scheme that players of the previous game will be very familiar with. Rather than the usual tutorial on the field, you get to open several packs of cards to begin building your team. This is both challenging and fun, and if you’ve played the game before this would definitely be a welcome feature. The control scheme has also improved and makes full use of your mobile’s touch screen interface. If your main concern is accuracy, there is the joy pad, and with it you can control the game to a fine degree. The presentation is very nice and the graphics, as noted, are exceptional. The players also move better and there’s something more refined about it compared to the previous release. The game will have you using an Ultimate Team lineup, and with so many options available you can just keep playing the game without it feeling monotonous. The best thing is you can play FIFA Ultimate Team 15 for free, and there’s no need to spend a cent. You can pay for the IAPs if you want, but if you’re really into football you’ll be able to master it without them.